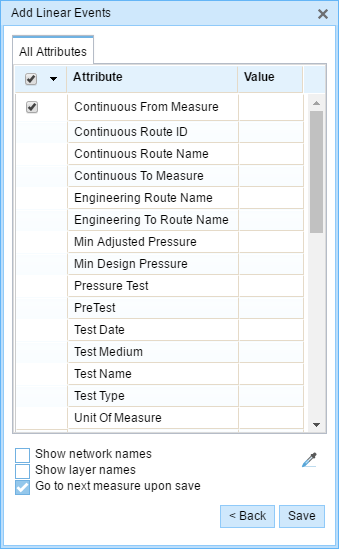 The attribute sets are useful in limiting the number of record input fields while using the Add Linear Events widget. The user enters the records only in the fields provided by the attribute sets. 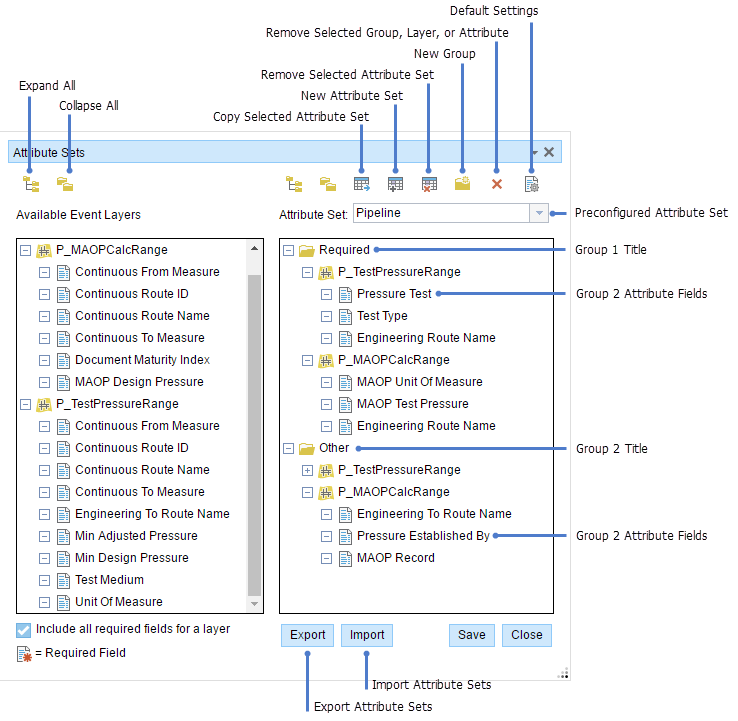 Shows all the attribute fields present within each event layer. Hides the attribute fields to show only the event layers. Copies all the attribute fields present in an event from the left panel to the attribute group in the right panel. The copy is made permanent only when you click the Save button. Creates a new attribute set. The attribute sets created by using this button are saved in the browser. Therefore, these attribute sets are available only to the user's browser. Removes the selected attribute set from the widget. The administrator-configured attribute sets cannot be removed using this button. Creates a new group in the right panel. A group contains event attribute fields. An attribute set is made up of one or more groups. The group is saved permanently by clicking the Save button. Removes a selected group, layer, or attribute from the right panel. The removal is made permanent by clicking the Save button. 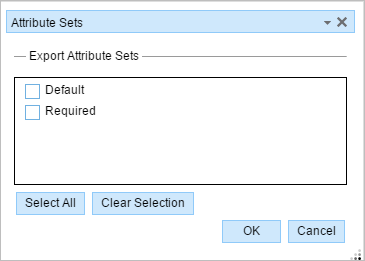 Allows configuration of default settings for attribute sets. These settings include the default network, from method, from measure units, to method, and to measure units for the Add Linear Events widget. By default, the Event Editor is configured to use the attributeSets folder. You can modify the configuration to use a different folder for your attribute sets by editing the config.json file of Event Editor. In the Event Editor folder, rename the attributeSets folder or create a new folder in which attribute sets will be stored. Open the config.json file in a text editor such as Notepad. For more information on using the config.json file for Event Editor, see Configuring the Event Editor web application. In the config.json file, browse to the attributeSets section. Browse to the subsection titled folder. Here, you can modify the default attributeSets folder by changing the folder name. Replace the default attributeSets with the name of the folder where you will store your .rhas files. You can export an attribute set using the following steps. In the Event Editor, click the Edit tab. Click the Modify Attribute Sets button . The Attribute Sets dialog box appears. Create a new attribute set. Alternatively, you can import and modify existing attribute sets shared with you by another person. For more information, see Configuring attribute sets. The Export Attribute Sets dialog box appears. Select the attribute sets you want to export. To select all attribute sets, click Select All. To clear selected attribute sets, click Clear Selection. When you are ready to export, click OK. Your attribute sets will be exported to an attribute set (.rhas) file. If you have multiple Event Editor configured in one deployment, then you might need to provide a separate attribute sets folder for each configuration. If not, then, the same attribute sets will be visible across all configurations. Browse to the location of the Event Editor folder. Browse to the attributeSets folder, which is created upon installation of ArcGIS Pipeline Referencing for Server, or to the folder you specified in the config.json file. Open the attributeSets folder and add the .rhas file you exported in step 6. Your attribute sets can now be accessed by any person using the Event Editor. In a web browser, browse to the Event Editor application. Click the Edit tab, and click the Add Line Events button . The preconfigured attribute set can be used to record attributes in this widget.